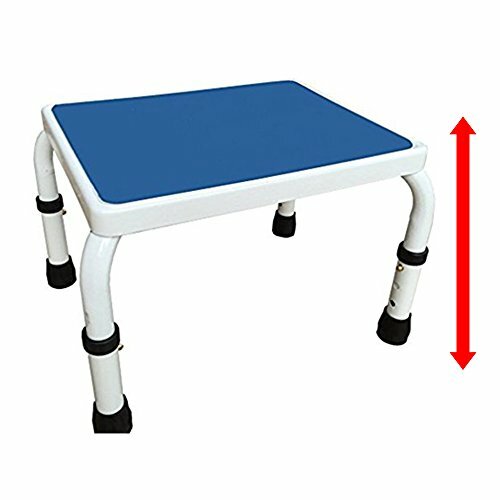 The only height adjustable step stool available. Select a platform height of 8.5, 9.5 or 10.5 inches. Assembles in seconds without tools. Rugged steel construction with a modern white powder coated finish. Non-slip platform and footpads for optimal safety. ADJUSTABLE HEIGHT- Choose the optimal step height in seconds. Select 8.5, 9.5 or 10.5 inches from the floor. ALL STEEL CONSTRUCTION- Rugged, commercial quality construction for safety, reliability and durability. NON-SLIP- Platform surface and legs are fitted with premium non slip material for safety. MODERN DESIGN- Attractive white and blue design.